After his death last year the Independent newspaper described Séamus Heaney as “probably the best-known poet in the world”. According to the BBC, at one time Heaney’s books made up two-thirds of the sales of living poets in the UK. Séamus Heaney won a Nobel prize and every bauble imaginable but was it as much for his affable and erudite PERSONA as for his poetry or his insight? Heaney immersed himself in a world of mythology and archaeology, finding his contemporary if anachronistic focus down on the farm, close by the sights and sounds of the bog. The poetic method isn’t great. For example in his totally famous poem, ‘Digging’, Heaney claims that his grandfather could cut more turf in a day “than any other man”. This is his trademark: anecdotes chopped into lines of verse. But is it poetry? In the same poem he views himself as unfit for farm work or turf cutting having only his pen, and concludes implausibly: ‘I’ll dig with it”. The image does not work. Though great poets must be particularly alive to the spirit of their times, Heaney’s inspiration is not modern. In the introduction to his translation of the Anglo-Saxon epic Beowulf he admits his passion for “a nostalgia I didn’t know I suffered until I experienced its fulfilment”. This fulfilment saturates his final collection, The Human Chain set – characteristically – in the old familiar farmyard and prefaced with a workaday title poem about lifting grain on to a trailer “with a grip on two sack corners”. Timeless perhaps, but searingly relevant to a traumatised post-industrial world, to an adolescent Ireland of abuse, corruption, pillage, Trouble – hardly. It was not untypical that when Heaney finally decided to address the issue of the road proposed to dissect the ancient site of Tara, it was in the letters pages of the Irish Times. And too late, since a decision had already been taken. He never commented publicly on the destruction of the environment in the country he called home, which reached an uncosy, corrupted crescendo during his prime. Heaney’s poetry rarely leaves the farmstead for its subject matter. A Heaney poem entitled “Thatcher” will not be about politics. All of his pastoral work is nostalgic and anecdotal: “Churning Day” ; “The Forge”; “Gifts of Rain”; “Blackberry-Picking”; “Turkeys Observed”; “The Harrow-Pin” ; “Conkers” ; “The Seed Cutters” ; “Nostalgia in the Afternoon” ; “A Basket of Chestnuts”; “The Pitchfork”; “The Settle Bed”; “The Sandpit”; “Bog Oak”; “The Hill Farm”; “The Water Carrier”; “At A Potato Digging”; “The Gravel Walks”; “The Skylight”; “The Baler”; “Fireside” and “At the Wellhead”. Heaney’s obsession with the farm is about as broadening as a visit to an agricultural folklore museum. The preoccupation with bogs was all-enveloping as he turned to bog corpses, skeletons and bones – all safely distancing him from the sectarian Troubles whose heinous burials of course find no resonance in Heaney. At base, Heaney is a poet of nostalgia for home, hearth, turf fire, hen-house and bicycle. His accessibility to readers equals that of Maeve Binchy whose chick-lit is if anything slightly more modern in content. The broadcasting equivalent is Miriam O’Callaghan (completely modern). He became everybody’s favourite, famous Séamus. Everyséamus. Approachability is Heaney’s be-all. Last August, in a New York Times article, ‘Another Kind of Music’on the day of Heaney’s death, songwriter Paul Simon – the thoughtful half of Simon and Garfunkel (“Lie la lie, lie la lie la lie la, lie”) – noted his “verbal virtuosity, his wit and Irish charm. Recovering from a stroke in the hospital, he greeted his friend and fellow poet Paul Muldoon with, “Hello, different strokes for different folks”. One wonders how Simon or Muldoon would have coped with the verbal virtuosity, wit and Irish charm of an unwell Joyce or Beckett. Heaney’s lack of engagement with the Northern conflict was on display early on, in ‘Summer 1969’. “While the Constabulary covered the mob/Firing into the Falls, I was suffering/Only the bullying sun of Madrid”. The poem concludes with his retreating for the “cool of the Prado” to look at Goya’s painting ‘Shootings of the Third of May’. His empathy was that of the tourist. His procrustean admirers explain that he was actually always obliquely engaging with the North. Heaney’s best-known poem “Digging” ludicrously compares a pen to a gun to a shovel! It begins: ‘Between my finger and my thumb/The squat pen rests; snug as a gun’. It’s inaccurate, of course, in that a gun is not usually held between finger and thumb like a pen: a hand-gun has to be held using all fingers. However – after he had indeed toasted the queen – Heaney’s most trenchant utterance came in 2013 and was surprisingly non-Nationalist for someone of his background: “There’s never going to be a united Ireland. So why don’t you let them [Loyalists] fly the flag?”. Bill Clinton serially, and nearly every cliché-unaware tout with a speech to make about the North and a message of political blandness, can be relied upon to marshal Heaney’s phrase from Sophocles in translation that occasionally “hope and history rhyme”. The poetry has became jingle before it acquired resonance, or even meaning. 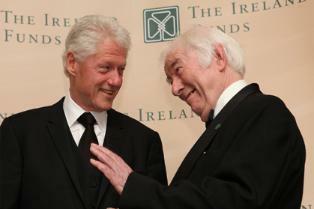 Heaney did world leaders and celebrities and was quite at home, for example in the Unicorn at a table of Clinton, Bono and twenty others, with Denis O’Brien picking up the tab, and – one imagines – private jets waiting at the airport for when the post-prandial brandies and payoff recitation had finally been discharged. Séamus Deane, a direct peer of Heaney, wrote of him in the New Yorker in 2000 as having been from the beginning ‘“well in” with those in power – teachers, professors, and the like [but a]t the same time, he was conspiratorially against them, holding them at arm’s length by his humour, his gift for parody […] it was Heaney’s way of dealing with his own contradictory sense of himself: his authority and his uncertainty. The balance between these was not delicate”. Nor did it get more delicate with age. Heaney’s profile as a poet spawned his persona as Ireland’s smile-eyed cultural minister without portfolio, led to posts in Harvard and Oxford, to awards including a Nobel Prize and to multifarious worthy endorsements. The academics, passive Eng. Litt. students and Booker-Prize novel-buyers felt securer reading Heaney because of his London publisher, Faber & Faber. Among academic critics who lavished praise on him, were Harold Bloom and Helen Vendler both of Harvard, John Carey of Oxford, and others such as poet Blake Morrison and collaborating academic Neil Corcoran. All of these were comfortable in following the American poet Robert Lowell’s misguided high praise that Heaney was “the best Irish poet since Yeats”. Lowell’s editorial backer was TS Eliot, justly acknowledged as THE supreme modernist poet and founding director of Faber & Faber. After Eliot’s demise, Charles Monteith from Lisburn, County Down, a former London barrister, took over and reflected the taste in poetry of his milieu. Monteith was a friend of Louis MacNeice, also a Faberman as were Auden, Lowell, Berryman and Hughes who brought to Faber, albeit posthumously, the poetry of his legendary ex-wife, Sylvia Plath. Monteith’s mission in the 1960s was to aggrandise Richard Murphy, a fellow Irish Oxonian of Monteith’s and Heaney who would later haul into Faber one of his students at QUB, Paul Muldoon. Monteith’s ‘finding’ Heaney in the 1960s at the beginning of the Troubles proved to be good for business. Heaney had the unobvious Northman cachet but was with all decidedly a ‘safe’ poet. Monteith rushed out four collections in a decade followed by Selected Poems. There was the bonus of media coverage when Heaney went into permanent exile in Dublin in 1972 with a summer house in Wicklow while being flown about in the Faber helicopter on beaming poetry-reading tours. Heaney’s wife Marie Heaney, née Devlin sister of Barry Devlin of Horslips, ensured an easy entrée to RTÉ’s arts programming. Heaney was now sticking with his farmyard themes and continually ploughed the same furrow even in later collections with mawkish titles: Field Work, The Haw Lantern and Opened Ground. With a recommendation from Professor John L Sweeney Harvard reeled him in and Oxford soon followed by teeing up the Professorship of Poetry. His apotheosis as Nobel Laureate conjured an assured brand name in poetry: Famous Séamus Heaney. To criticise Heaney’s poetry is not permitted, and to do so in company is usually disapproved of as a definitive indication of being officially untutored. Mainstream reviewers – and who would not wish to be among them? – as well as academic journals dare not speak out against his work. Two analytical essays break the rule: Desmond Fennell’s ‘Whatever You Say, Say Nothing’ (1991) and James Simmons’ ‘The Trouble with Séamus’ (1992). When Éamon Dunphy criticised Heaney as “a sham national poet” in 1995 in The Sunday Independent he was seen as attacking a sacred cow. Indeed inevitably Heaney has the appropriate poem in praise of bovine pregnancy, “Cow in calf”. And Dunphy recanted on his death bed (Heaney’s). A Nobel-winning poet propelled by a tide of charm, fashion and politics, he never rivalled Shaw, Yeats, Joyce or Beckett. Heaney’s Nobel acceptance speech lacked rigour: “I credit poetry, in other words, both for being itself and for being a help…I credit it because credit is due to it, in our time and in all time, for its truth to life, in every sense of that phrase”. This clearly reveals Heaney’s shallowness of poetic insight. The sentiment is weak and the analysis is circular and otiose, that poetry is always merited because of its truth-to-life factor! “When a poem rhymes, when a form generates itself, when a metre provokes consciousness into new postures, it is already on the side of life. When a rhyme surprises and extends the fixed relations between words, that in itself protests against necessity. When language does more than enough, as it does in all achieved poetry, it opts for the condition of overlife, and rebels at limit.The vision of reality which poetry offers should be transformative, more than just a printout of the given circumstances of its time and place”. But is Heaney’s lifey analysis not ultimately guff: what is his protest against necessity, what transformation did he seek? Posterity will be the ultimate judge. Popular reputations fade. Poetic oblivion is a purgatory haunted by once over-rated literary reputations including those of William Allingham, Padraic Colum, James Stephens, and among British poets laureate (Heaney turned down the accolade), Robert Southey, Alfred Austin, John Masefield and Cecil Day-Lewis. Thomas Moore and Robert Burns are lately rated not even as poets but as song-writers (like Dylan and Morrissey). Paul Simon told the New York Times: “Songwriters have melody, instrumentation and rhythm to color their work and give it power; poets accomplish it all with words. Séamus, though, was one of those rare poets whose writing evokes music: the fiddles, pipes and penny-whistles of his Northern Irish culture and upbringing. Wrong, except for those nostalgists who strive to find penny whistles in every corner of this Emerald Isle. Heaney had no songs. Nor is he quotable, as evidenced in the obituaries that yawningly rehashed the most predictable lines from ‘Digging’ (cited above). Did anyone ever try digging with a pen? It would go no deeper than the topsoil and leave no long-term legacy. The worry would be it was merely – the worst of all artistic sins – going through the motions. Next article Whistleblower threatens Mulryan. By Frank Connolly.